175 years ago today (March 1, 1842), the Articles of Faith were published for the first time in the Times and Seasons in Nauvoo, Illinois. Joseph Smith wrote the articles in response to a request from John Wentworth of the Chicago Democrat. In this letter, Joseph wrote a list of statements about what members of the Church believed. 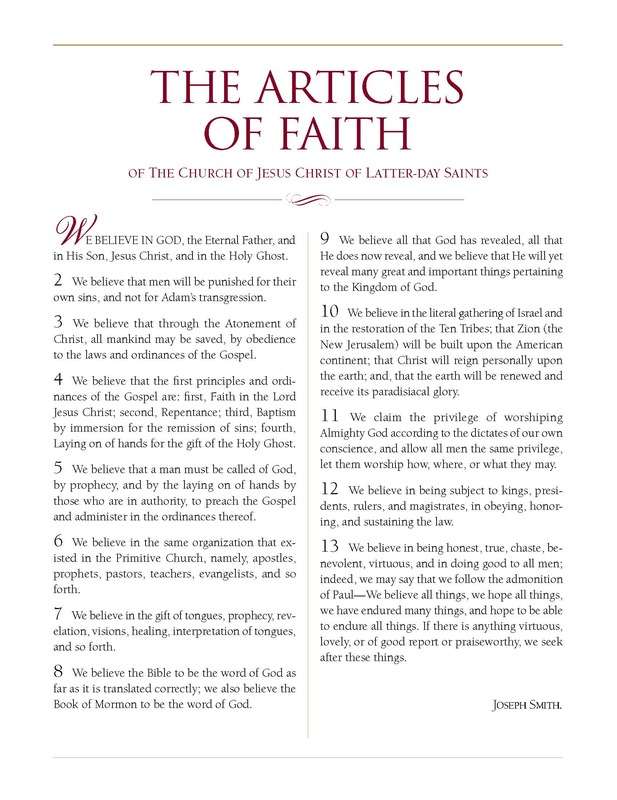 The Articles of Faith outline 13 basic points of belief of The Church of Jesus Christ of Latter-day Saints. They are now regarded as scripture and are included in the Pearl of Great Price as Articles of Faith 1:1-13. Below is an 8.5″ x 11″ poster of the Articles of Faith. Download a free printable PDF.